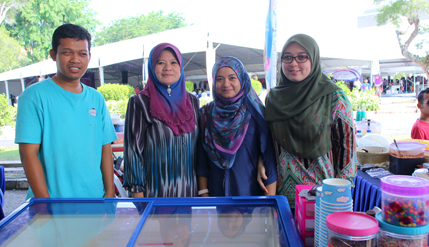 BANGI, 12 June 2014 – A group of disabled students from The National University of Malaysia (UKM) has emerged as pioneers from among those in public institutions of higher learning in the country to venture into a business. A club set up for students with disabilities at UKM called Special Students Club (KMI) owns a shop, Santai Istimewa situated on Level 7 of the Pusanika complex in the UKM campus here. KMI spokesman Wan Mohamad Syahir, 29, told UKM News Portal the club aims at providing training to encourage its members to become independent entrepreneurs. Records showed that the club is probably the only one of its kind among public institutions of higher learning in Malaysia to operate a business venture. Wan Mohamad, who is doing his Masters at the Faculty of Social Sciences and Humanities (FSSK), said the shop began operations on March 1, with a capital of RM10,000. A partnership of three members began managing the shop with a business plan prepared by an alumni who has some business experience. Sales at the store have reached RM100 per day. KMI is getting the cooperation of a company Fuzail Resources that markets a branded premium ice cream Parabella. KMI had also operated a stall at the Islamic business carnival in conjunction with the National Islamic Missionary Programme 2014 in the campus on May 30. The company uses financial data from Google Drive where all partners can access its transactions from time to time. Thus, financial matters are systematically managed through the use of Google Drive system which ensures zero calculation errors but is yet fast and easy. KMI, however, faces some constraints because it does not have enough staff to run the business due to lack of capital to hire workers. Wan Mohamad said the venture could do with capital injection as the outlet needed to be upgraded to ensure comfort for its shop assistants. KMI also do not have enough money to do general repairs in the shop including a leak on its ceiling. The shop also needed specially designed tables to serve ice cream but they are very expensive because each one has an electrical socket, Wan Mohamad said.